Yesterday I published an excerpt from "A LETTER CONCERNING A VISIT TO OCRACOKE" By C.A. Weslager. The letter was written July 31, 1949 from Wilmington, Delaware. "Between Ocracoke village and Hatteras, the terrain is bleak — the sea on one side, the sound on the other, less than a mile separating them. 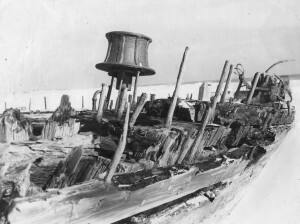 All along the beach are remnants of wrecks — one called the "ghost ship" is still partially intact. Offshore, one sees the masts of wreckage extending above the water level at low tide. The heat was terrific — no trees — just wild grass here and there. There was a flock of wild horses grazing on a patch of grass at the end of the island. We were told that they dig in the sand with their forepaws to expose surface water when they are thirsty. Each home on the island has a rain barrel under the eaves — their source of drinking water. The hotel had a large rain-water reservoir on the roof to supply drinking and sanitary facilities." Do we know of C(harles) A(lbert) Weslager? A simple internet search reveals facts about this prolific collectable author. A former DuPont employee ($$$) and college instructor this trip to OI could have been a fact finding trip to "develop" the bleak island as an investment. As one knows Wilmington Delaware was a resort town with many a "cottage." I am not aware of any attempt by Mr. Weslager to develop Ocracoke, or even to purchase land on the island. Mr. C. A. Weslager was President of the Eastern States Archeologial Federation. He was the author of seven books and numerous historical papers and essays, including "Place Names on Ocracoke Island." I do not know how he discovered Ocracoke, or if he ever returned. A simple internet query "DuPont invests in Outer Banks" results in a Champagne Chateau MSL real estate listing at $4Million plus in Duck NC. Some how the Duponts discovered the OBX.